Add & mix the vegetables in a bowl.Prepare the dressing and add to the vegetables. Mix well. Chill & serve! Nice blog. Lovely pictures... but very few recipes. the corn salad looks lovely and colorful. in fact all your recipes are pictured so well. you have a beautiful blog. Your comment in my blog brought me here. 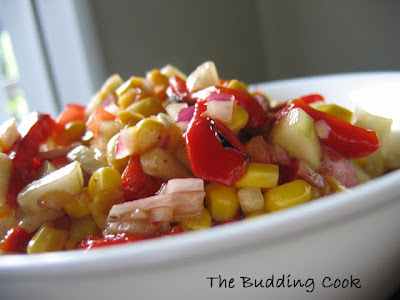 Nice blog and I love all the pictures.Love the corn salad. Keep up the good work buddy. I will try adding mangoes too the next time. It can only taste better, right?! I started blogging just to take pics of the things I make! ( does that even make sense?? ;-))See, I have developed this new found interest in food photography thanks to the gazillion food blogs out there! For me, jotting down the recipe takes more time than making the dish itself. I wonder how you and a couple of others manage to post so many recipes with pics and step-by-step instructions in a single day. Hopefully, I will be able to do both soon. 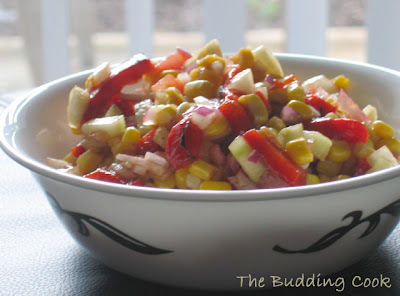 I just followed your link.Your corn salad looks good.I will try the " Indian " way of making it the next time. Thanks, Sharmi!Coming from you, that really means a lot. I have been visiting your blog whenever I got a chance.I just loved your pic of the pineapple flower cups.Absolutely drool-worthy! Thank you for the encouraging words, Seema. The blooming, finally! A recipe! A very bright and colourful salad, TBC; the honey is a nice touch with the balsamic vinegar. hey TBC are you from TIA? you have a nice blog here and all the photos are well taken, thanks for hopping to my blog...I love the corn salad, surely try as all the ingre are readily available..
Viji, thanks for visiting me! The salad is perfect for summer & can be put together in 10 min. Please do keep coming back when you get a chance! SeeC, welcome to my blog & thank you! Thanks for complimenting my photography.... I suddenly developed an interest! Thanks for visiting!Thank you for your kind words. Do try the corn salad. It is the easiest thing to make. Let me know how you like it. This is my first time here....nice colourful salad. The salad tastes better than it look, do give it a try! Now, I'm off to checkout what you have to offer. thanks anyways, nice knowing you! Hey Raaga, you're back! Hope you had a good time!